Kids can enjoy a fun park created by the Delhi Fire Department on both Saturday and Sunday. Depending on weather, there will be between six and eight different pieces of equipment for all to enjoy. 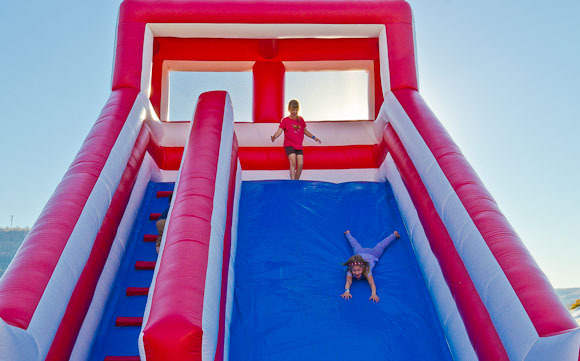 There will be bounce houses and slides that can be enjoyed by children of all ages. Best of all, you can purchase an all-day wrist band for your child to enjoy unlimited fun! And what's better than that? This is a great way for your children to have fun while you enjoy a relaxing time at the festival and you can help the Fire Department raise money at the same time! All-day bracelets are just $10 at the Festival. Online ticket sales will end at midnight on Thursday, October 4. You will still be able to purchase tickets at the gate for admission and on-site for dinner. All sales final. No refunds. If you purchase tickets and can not make it, we can transfer to another person. Please send email to info@tasteofthecatskills.com if you’d like to make changes. Check out this cool video! (not all items shown in video will be available).